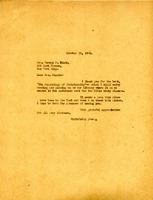 Letter states that the books discarded by the Brearly School have been shipped to Berry. 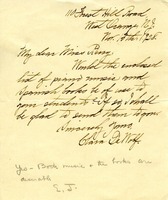 Letter to Clara DeWolf from Martha Berry informing her that the music and books that she mentioned in her letter would be very desirable to the schools. Miss Berry asks her to send them to the schools at her earliest convenience. She also thanks her for her continued interest and generosity. She also wishes her a Happy Christmas Season. Gift of books for students of the school. 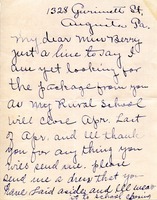 Rosa L. Davenport asks about the package from Miss Berry containing clothing and books for her Rural School. 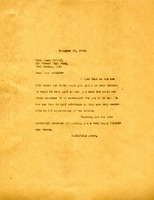 Clara Brownell writes to Martha to tell her that the box of ten books for the library was shipped to the school. They hope that the books will be of service to the school. 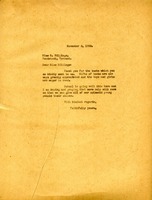 Edna G. Cosgrove asks to have her name and address changed in the school's records; she was previously Edna Gibson. She encloses a contribution and alerts Martha Berry that the boys in her class at Columbia Grammar school have sent three packages of books, noting that because these boys have much (perhaps too much) they will be able to send more books from time to time should Berry wish. 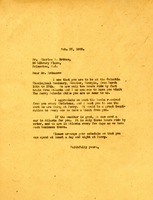 Letter to Miss E. Billings from Martha Berry thanking her for the books she donated to the schools. She informs Miss Billings that the boys and girls are eager to read. She also informs her that school was going well in that term but that she hopes more help will come so they can give their young people their chance. Mr. Barrow sends an "Animal Curiosity book" which he thinks will interest the students. He asks Miss Berry to let him know how it impresses her. 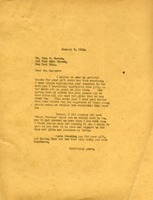 In this letter Martha Berry thanks Mr. Barrow for his contribution to the Berry schools as well as the book "Heart Throbbs". This is a note sending $15 to Miss Berry. Mr. Barrow shows concern that he sent a book to her earlier that was not acknowledged and asks that she acknowledge this gift.